In time we hope to gather many of the histories of the churches pictured below. 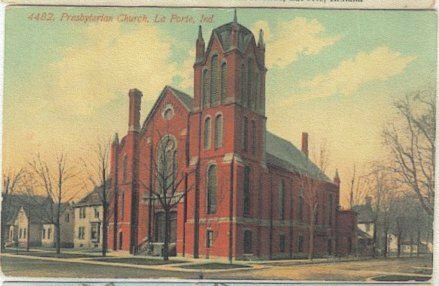 If you have a history on any of the LaPorte County Old Houses of Worship and would like to share it with us and/or contribute photos of the same, contact us at laportecountyin@yahoo.com Also See the History of LaPorte County where many are mentioned. Door Village United Methodist - 1832 - Rev. James Armstrong, a young Irish Army Chaplain, appointed Presiding Elder of the Northern District. While making a brief stay in the area with a detachment of soldiers, sent to protect the settlers from possible Indian uprising, he fell in love with the beauty of the area and resturned a short time later with his family and helped establish the first Protestant church in the norhter part of the state. He is buried in Door Village Cemetery. The first church had 15 charter members. And this little congregation grew steadily and in 1849 a second church was built. It had clear glass windows and a stubby bell town, which never held a bell. 1857 - First parsonage purchased and in 1906 another parsonage was constructed with stained glass windows. This was built by Joshua Watson in memory of his beloved wife. 1832 - first session of the Methodist Indiana Conference held in the autumn of 1832. 1833 - The first class organized in the city of same. 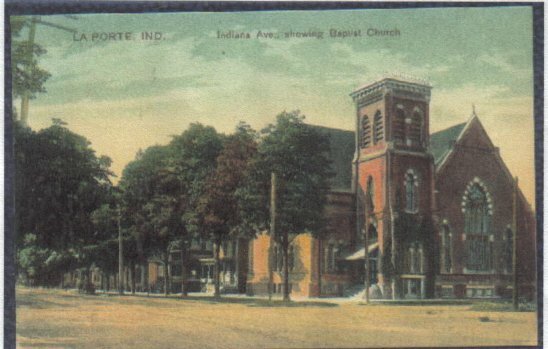 1836 - First Church in City of LaPorte built by the Methodist on the NW corner of Jefferson & Monroe Sts. - George Boyd, Presiding Elder. Same year, Methodists also organized a Sunday school with A. & J. B. Fravel accomplishing this task. J.B. Fravel also cut the hair of several men in the area for 10 cents a cut and contributed the money toward a Sunday School Library. Daniel Webster on July 4, 1836 made a tour through the West and stopped at LaPorte. The Methodist Sunday School children, in a patriotic gesture, marched around the court house square. 1846 - District Conf. was held in LaPorte, Bishop Morris presiding. 1847- LaPorte made a station. 1850 - Congregation has outgrown church built in 1836 and build a new brick one on Monroe Street between Jefferson and Maple Avenues. It was used until 1928 when the Baptist Missionary Church commence using the building. 1851 - Mrs. Maria Baumgartner organized a German Methodist Congregation. 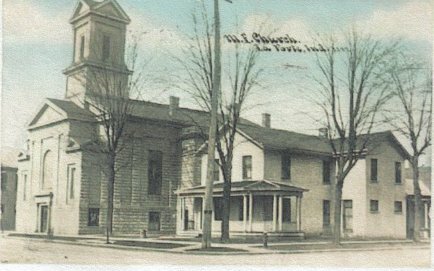 1853 - German Methodist purchased a frame building from the Indiana Medical College and moved it across Clay Street for their first church building. 1855 - First parsonage was built and is still standing today. 1863 - Through the guidance of Rev. George Boyd, who was named minister, he received 100 new members and this enabled the church to clear its debts. 1884 - German Methodists build new church on the corner of Harrison and Clay Streets. They later would unite with the Methodist Episcopal Church and moved in with them to the new church in 1928. 1895 - Class for the deaf organized. Thise would be the first type of class outside the city of Chicago. 1902 - Extensive remodeling on both church and parsonage - during this interum they would meet in the Hall's Opera House. 1913 - Lightening hit the bell tower and the bell could never be used again. 1919 - German Methodists united with Methodist Episcopal. 1927 - May 1st - ground breaking for a new church on the corner of Alexander and Michigan - George Allen, arhitect an Larson and Danielson contractors. Church is that of Gother architecture. October 9th of same year, corner stone laid - Rev. Alpha H. Kenna is then at the helm. 1928 - November the 4th - All the Sunday School members, 700 strong, parade from the Monroe Street church in one solid line to the new building. No classes held on this date but members did tour the buildings and located their class rooms. 1939 - Methodist Espiscopal Northe and South churches and Methodist Protestant merged and becamse known as First Methodist. 1944 - August 30th - Helen Wilk, missionary from the LaPorte church to the Philippine Islands, who worked with guerilla forces during the Japenese Occupation in WWII was executed with forthy others after having been tortured for many months. 1968 - Methodists merged with Evangelical Brethren Church to become First United Methodist. city of La Porte. 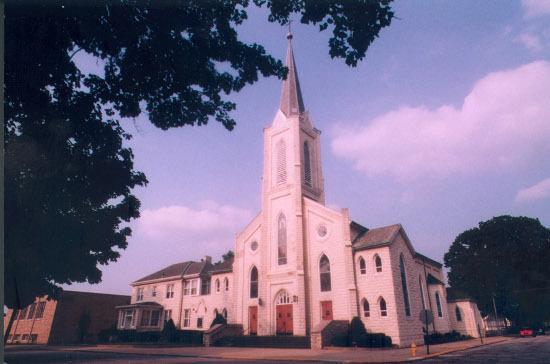 The church is located at the corner of 130 Bach Street and Pulaski. Sacred Heart also has a section in Patton Cemetery, this city, where many of their deceased members have been laid to rest. St. John's Lutheran church - History of St. John's Church originally located at "A" Street, La Porte, IN. - St. John's Church was founded on July 19, 1857 and the 1st service was held by Pastor R. Tramm (Frederick Reinhold Tramm) who was officially elected as the 1st Pastor on July 29, 1857. St. John Cemetery, in Center township was purchased from A. P. Andrew Jr and Viola Andrew on April 22, 1870. The 1st tract of land was 5 acres of land with a 2nd tract purchased of 3 acres. Information was found in recorders office at LaPorte County Court House deed book 30 page 117. In 1880 Mr. Rumely representing St. Joseph Catholic Church made an offer to by a tract of land from St. John's Church Cemetery. Offer evidently was accepted as St. Joseph and St. John's Cemetery meet with no land division between. 1833. The Government had a land office located where Laporte now is, for the purpose of disposing of the land, in the year 1833. Settlers had arrived here as early as 1830. The town was surveyed in the year 1833. The first railroad to enter into Laporte was, what is now known as the Lake Shore and Michigan Southern, in 1852, and extended to Chicago the following year. The Lake Erie railroad wa built between Laporte and Plymouth in 1856, and in 1871 the branch to Michigan City. With the building of the railroads Catholic families settled in Laporte. In those days, priests from Notre Dame visited the place at regular intervals, and Mass was celebrated in private houses. Mass was also celebrated in the old university building, better known as the Medical College, which was situated on the site of the present "Central School Building." Mass was even said in the old Methodist church, located on the northeast corner of Jefferson and Monroe streets. 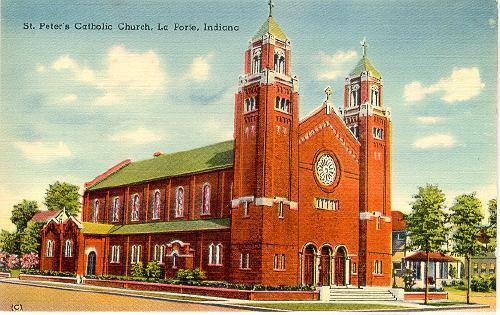 In the history of Laporte, by Packard, we read; "The existence of St. Peter's Church is almost coeval with that of the city of Laporte." An old baptismal record, and old records prior to 1870 show, that this church was formerly called the Church of the Nativity of the Blessed Virgin Mary. In 1849, the Holy Cross Fathers visited Laporte, and said Mass once a month in a little school-house, at the west end of Harrison street. When no opportunity for Mass was given in Laporte, people would travel twelve miles over sandy and rough roads to Michigan City, to assist at the Holy Sacrifice. Many of them would go to Notre Dame to receive the Sacraments. The Holy Cross Fathers traveled, either in cumbersome farm wagons or on horse back to reach Laporte. [pg. 250] Rev. M. P. Rooney built the first church, 30x40 feet, part of which is still standing. It was erected between 1853 and 1854 and was very primitive. The faithful knelt upon mother earth, the altar was constructed of dry goods boxes, confessions were heard by the priests sitting on the altar steps. Later on, Rev. Francis Lawler added wings to the building, and to the rear of the church annexed the priest's house. Here the priests lived until 1880, when Rev. M. E. Campion built the present house, at a cost of $1,793. Rev. John Crawley remodeled the church, in 1893, and built a steeple: but he did not live to celebrate Mass in the church he had beautified. From the year 1840, Rev. F. Cointet, C. S. C., Rev. A. Shortis, C. S. C., and Rev. C. Schilling, C. S. C., visited Laporte and vicinity. Father Rooney was the first resident pastor. After him came Rev. R. Wallace, C. S. C., and Rev. B. J. Force, C. S. C.
From 1854 to July 1859, Rev. E. B. Kilroy was pastor. Father Kilroy was succeeded by the Rev. Francis Lawler, the first secular priest in charge of this parish. Rev. Timothy O'Sullivan was pastor here from 1870 until June 1880. He also visited the missions Walkerton, Wanatah and Westville. During his time the Lake Shore railroad shops were moved from Laporte, causing an enormous decrease in the Catholic population. Father O'Sullivan was succeeded by the Rev. M. E. Campion in June 1880, remaining until May 1883. He built the frame pastoral residence. Rev. James A. Twigg came next, from the spring of 1883 until the fall of 1884, when he was succeeded by Rev. J. B. Crawley. The latter contracted pneumonia when the remodeled church was dedicated, and died on December 19, 1893. Until October 1897 Rev. John Grogan was the pastor, when he was compelled to resign owing to bad health. The present pastor was appointed on October 9, 1897, his name is Rev. George M. Schramm. The present church property has 188 feet front on Monroe street. The ground was secrured by the founder of Notre Dame. The seating capacity of St. Peter's Church is 400. 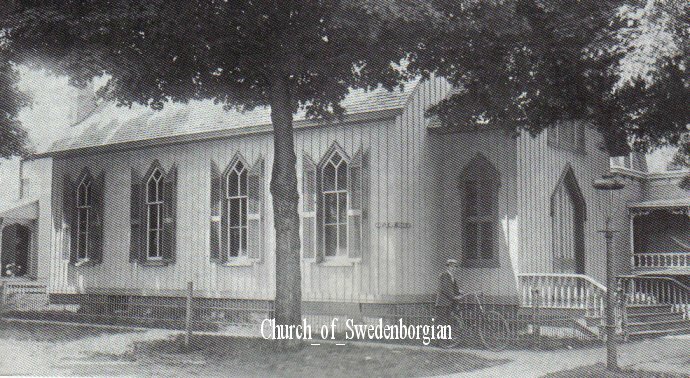 Brother Daniel, C. S. C. taught school, in 1855, using the church for a school-room. In the spring of 1856 school was taught in a building, located where now the priest's house stands. Later on, the Sisters bought the Walker homestead, situated on Ridge street, the ground comprising an entire  block, and located at a distance of about five blocks from the church. The old school building was moved to this place, and here the Sisters opened an academy for girls, though it is the parish school also. The school having become too small, it is being enlarged, at the present time. These sisters are Sisters of Holy Cross. They reside in the convent, annexed to the school, which was formerly the old Walker residence and ran the school for 27 years. Non-Catholics also send their daughters to this school, which is called St. Rose's Academy. St. Peter's Aid Society for Men, with a membership of fifty-two, was organized in 1901. Its object is to unite the men of the parish and afford relief in time of need. The Rosary Society, for married Women, was first called the altar society organized in 1855, and has a membership of ninety-one. The Sodality of the Children of Mary, established in 1882, has eighteen members. In 1903, the St. Aloysius Society was organized, with a present membership of twenty. The Young Ladies' Sodality of the Immaculate Conception has seventy members. The numbers of families is 162, numbering 654 souls. The debt on the church property is $1,000. Millcreek and Stillwell are stations, attended from Laporte. 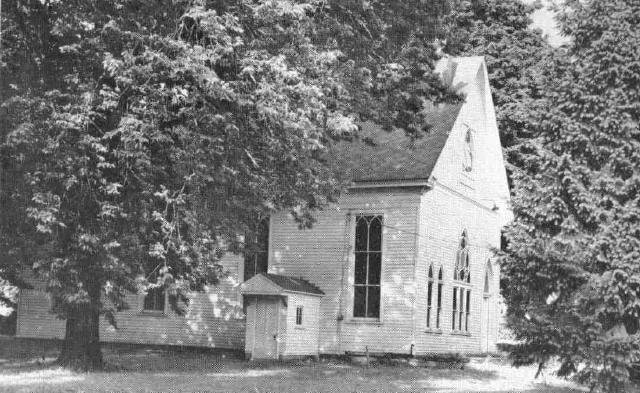 The pioneer pastors of Laporte had the care also of Chesterton, Warsaw, Walkerton, Wanatah and Westville, at different times. A statement concerning St. Peter's Church at Laporte, dated July 26, 1872, made by Rev. Timothy O'Sullivan to Bishop Dwenger, presents some interesting items. A few may be given: "Value of church property $6,375. Number of Full Families, including Walkerton, Fish Lake and Eastward on Railroad about 105, of these forty-five families to little or nothing for the church; some of them scarcely ever make their appearance in church. Families of Widowers or Widows, twenty-two, of which eleven pay little or nothing towards the support of the church. Parties married to non-Catholics five, of which three do nothing for the church. One woman has become an infidel. Young women or men working fro themselves fifteen, of these six pay nothing or very little. Since my arrival at Laporte, about twenty-seven families have moved away. One or other of the parties is German. We have parochial school and an Academy of the Sisters of Holy Cross. Income: Pew rents about $600. Sunday collections  $140. My salary here has been $600 a year. Since I received charge of Chesterton, I always try to supply my place here on Sundays by a priest from Notre Dame." Rev. John Kendall served the congregation of the Presbyterian Church in LaPorte from 1871 to 1889. John and his wife, Julia Birdseye, hailed from Onondaga, NY. Julia would outlive him for many years and did not die until 1924.
foot note 2 - 1951 Commemorative Plate - The La Porte Indiana Church of God, had its beginning in 1913. Through the distribution of literature and the conducting of cottage prayer meetings Mrs. Amos Barden interested many. Later a Sunday School was organized. Then in 1921 the congragation purchased the property on 613 Rose Street, which was converted into a chapel. Under the leadership of teh present paster, the Reverend Martin J. Raab broke the ground for the new chapel on the corner of Clay and Ludlow, May 25, 1950. Dedication followed less then one year later on May 20, 1951. [Pages 273-274 (See Reference)] LAPORTE. 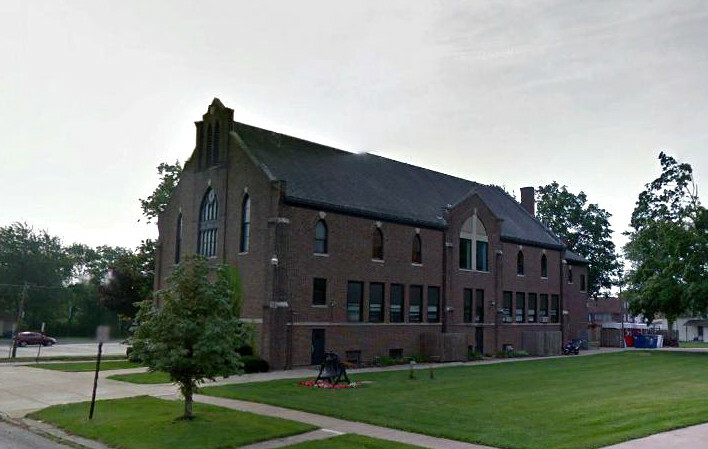 [LaPorte County] St. Joseph's Church. 1859. It was the well known missionary, Rev. F. X. Weninger, S. J., who in 1859 persuaded the German portion of St. Peter's  congregation, at Laporte, to form a separate parish. The first pastor of this new congregation, which was placed under the patronage of St. Joseph, was the Rev. Martin Sherer, who built the present church and remained eight or nine years. Rev. N. Y. Konen succeeded him, for a short time. For three years and two months Rev. Simon Bartosz was pastor. In January 1870, the Rev. J. H. Oechtering took charge. He built the present priest's house, and added the steeple to the church. After a pastorate of fully ten years, Father Oechtering was succeeded by the Rev. Joseph Nussbaum, who bought the present cemetery, secured the Sister' dwelling, procured a $1,500 pipe organ, frescoed the church and supplied the church with a full line of vestments. Father Nussbaum was a straight forward and outspoken man. He departed this life, as pastor of St. Joseph's, on December 26, 1895. For about six months thereafter, Rev. Julius Becks was pastor. After which time, owning to ill health, he was assigned to the hospital at Anderson. The parish school was taught by lay-teachers, from September 1880 to September 1896, when the Sisters C. PP. S. took charge. Two of these Sisters are at present teaching seventy-five children. The present pastor, Rev. Anthony Messmann, was appointed on July 9, 1896. During his pastorate new stained glass windows were placed in the church at an expense of $1,200. The church property has no debt on it. 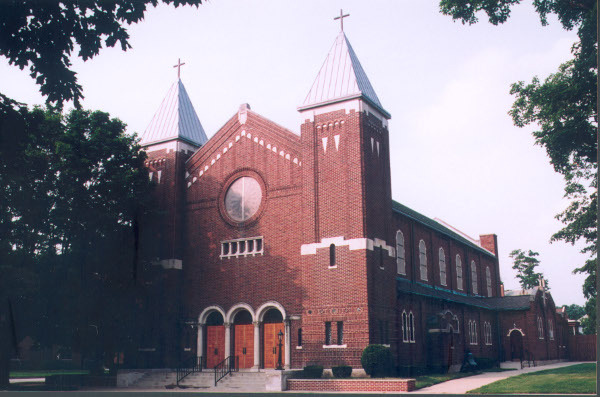 St. Joseph's parish has eighty-nine families, numbering 515 souls. The Rosary Society, for married women, has sixty members; the Young Ladies' Sodality has twenty-one members; the Holy Angels' Society, for children, has twenty-seven members; and the St. Joseph's Benevolent Association has a membership of forty-five.